"We include everything you need in this Palatino player pack. The violin features sold, hand carved woods for a great sound and feel, as well as a fine tuner tailpiece and ebonized fittings for easy tuning. 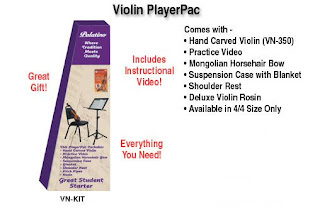 Also included is a shoulder rest, pitch pipe and a 60 minute practice tape."